A new edition of Jacaranda Maths Quest 11 Mathematical Methods Units 1 & 2 for Queensland Print & eBookPLUS + studyON is coming in 2018. Designed to help teachers unpack the new curriculum and help students at the point of learning, so that every student can experience success in the classroom, at home and thus ultimately in the exam. You will be able to purchase this title later this year, to learn more about the series visit the Jacaranda Queensland Senior Mathematics page. Maths Quest Maths B Year 11 for QLD 2E with eBookPLUS is part of a complete Maths package which includes Teacher Editions, Fully Worked Solution Manuals, and now also supported with eBookPLUS and eGuidePLUS! 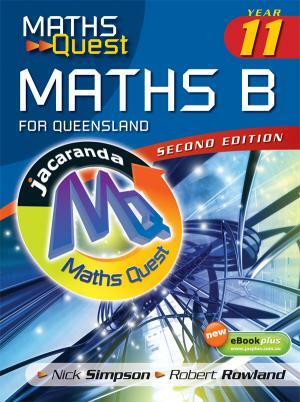 Click here to view Maths Quest Maths B Year 11 for QLD 2E eBookPLUS. JacarandaPLUS is the on-line home of all our digital resources for teachers and students. For teachers, there's eGuidePLUS. This gives instant access to on-line versions of both student and teacher texts and supporting multimedia resources, making teacher planning and preparation easier! Students also have access to engaging digital support via eBookPLUS. This gives 24/7 access to the on-line text along with a wealth of ICT resources making student learning more engaging! All JacarandaPLUS websites that host the eBookPLUS and eGuidePLUS will be live by the end of 2008 for use in 2009.